My friends and I sat around on Tuesday night and discussed our lives, and then the conversation turned more personal. They’re a close group of friends so we had an intense heart-to-heart about how much we lie to ourselves and others on a daily basis. As the room grew silent, we began to ponder exactly when the last time we lied was and what that lie was about. Moreover, we began debating what constituted a lie – if we chose a major to appease our parents and were now stuck in a job we never really were passionate about to begin with, did that constitute a lie? What we found was this: more often than not, our lies are white lies or lies of omission. We lie to our bosses, feigning excitement or interest or else pretending that we can handle ONE more project when really we’re five minutes away from a nervous breakdown. Our lies of omission come in the form of half-true text messages. We tell our friends that we have “plans,” when those plans really include take-out food, sweatpants, and Netflix. And it seems that we can’t quite avoid telling these tiny, little lies. It makes us human and it makes the study group in Community’s latest bottle episode “Cooperative Polygraphy” human, too. The study group has been together for five years now, which would make you think that they probably know every annoying tick, every dirty secret, and nearly everything about each other. But when I think about my own friendships, even those that I have had for eleven years, I realize that I don’t know everything about the people I’m closest to. There are still secrets that people keep buried because of shame or guilt or laziness and though those often bubble to the surface after years of friendship, sometimes they merely simmer. Unless, of course, you’re in the episode “Cooperative Polygraphy.” With Pierce’s recent passing, the study group has been instructed that they each are being investigated for the potential murder of Pierce Hawthorne. Pierce wasn’t murdered, of course, but that doesn’t stop him from hiring Mr. Stone to hook each member of the group up to a polygraph. If the study group members pass the test, they are bequeathed a part of Pierce’s million dollar estate. What is beneficial and integral in bottle episodes is the escalation of emotions between characters. When characters such as the study group or the friends from Central Perk are unconfined, they are a lot less likely to confront each other about things that they have personally buried. See, the benefit of life is that we are usually free to walk away from people who irritate us and to escape situations where we just barely are able to control our tongues. But bottle episodes are not the case. These episodes force characters into a room or an apartment. The confined space and the emotional stability of the characters seem to crumble (as seen by the dissolving of the study group in Community and the escalation of Ross’ anger and the Joey/Chandler fight in Friends). So is the point of a bottle episode then merely to watch characters slowly turn into Lord of the Flies? To watch as a group of people dissolves slowly into chaos and madness until they blow up at each other? No, though tension is an important part of the bottle episode format, it’s not necessarily the point of it. What the study group learns and what our friends from Friends learn is pretty simple – they need each other, regardless of if they’re searching for a purple pen or trying to get ready for an important event. The point of a bottle episode is to escalate tension, but behind that tension is a purpose: to, as I said above, expose the most vulnerable, agitated, weak sides of their character and yet ensure that they still learn from and love each other. The study group reveals a LOT to one another in the episode, whether begrudgingly or accidentally and it pushes them apart for a while before Jeff tries (feebly) to tie the threads of purpose together. But before we understand exactly why it is important for the study group to air their dirty laundry and WHY Pierce wanted them to do so before he hit them with an emotional, forceful blow, let’s discuss the plot of the episode, shall we? Briefly though before we dive into the plot, let me just say how impressed I was by Alex Ruben’s episode. Bottle episodes, as I noted in my “Cooperative Calligraphy” review, are what I would imagine to be the most strenuous, difficult kinds of episodes to write. There are one-two-punch jokes, walls of emotion, and rapid dialogue. When you confine characters who are used to roaming Greendale’s halls and beyond to the study room table for twenty minutes, you need to – as a writer – understand what makes each character tick. And every single element in this episode just WORKED for me because when you truly understand each of your characters, as a writer, the other elements (the comedy and the emotion) shine through. And what I really loved about the episode is this: Alex wrote dialogue for someone who is no longer on the show and made it sound both heartfelt and believable. It wasn’t trite or overwrought with sentiment and clichés – the final words Pierce Hawthorne delivered to his beloved study group sounded exactly like him. So thank you, Alex, for writing a fitting send-off to the character, while also allowing us to explore the issues of the other study group members (and laughing and crying a lot in the process). The episode opens with the study group members returning from Pierce’s funeral, all wearing robes and hats because let’s remember that Pierce was in a cult. While they discuss the aspects of the Laser Lotus cult and its merits and quirks, Chang enters, mocking the group and their attendance of Pierce’s funeral. The study group and Jeff, specifically, are offended by Chang’s peppy, antagonistic attitude and insist that they’re all upset about their friend’s death. Chang, I think, is made to be the mouthpiece for a lot of the fandom in this moment. I know a great chunk of individuals who despised Pierce as a character and who even believed that the series would be better off without him. And what “Cooperative Polygraphy” demonstrated is that no matter how far gone, to the study group, Pierce was still a FRIEND. And they don’t claim to miss him or be upset about his death because there’s a gnawing sense of guilt or belief that they should feel that way. They actually DO. And though Pierce is gone in this episode, he’s not forgotten, and his presence is as palpable as it ever was when he was present. 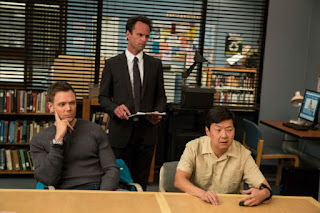 It is then that Mr. Stone enters, an attorney for the Hawthorne estate, informing the study group that Pierce’s will has stated that even if his death appeared to be under normal circumstances, an investigation requiring submission to a polygraph test should be administered to the study group (and Chang, but we don’t really know why). So the group answers some introductory questions, written by Pierce in his typical insensitivity (insinuating Britta is a lesbian and Jeff is gay, etc. ), while the polygraph testers read the results aloud. And here’s the intriguing part about the initial polygraph questions: they’re not meant to incite any issues among the group, and yet they DO. Furthermore, Shirley mumbles to herself “he [Pierce] is doing it again.” So DID Pierce actually mean to turn the group against one another with his simple preliminary round of questions? I think so. And here’s why: I think that after five years with the group and twelve years at a school where everyone treated him poorly and dismissed him and where he closed himself off to love and happiness, Pierce recognized how significant it was that Jeff, Britta, Annie, Shirley, Troy, and Abed found each other. He knew that the only thing, over the years, that kept bringing them together was their constant push and pull: they would fight and make up, the wounds seemingly vanishing to create a bond even thicker than before. Each time the study group fought, the end result was them becoming more intimate as friends and as family. And what, interestingly enough, did the group always bond over? Their belief that Pierce was always out to get them and that somehow he was the one most desirous to inflict pain and psychological games on them. Jeff acknowledges that they dismissed and fought with and were annoyed by Pierce when he was alive, and he’s right – the group kicked the elderly study group member out of their presence on multiple occasions. So perhaps Pierce knew that the one way the group would bond, the one way for them to grieve and deal with the reality of his death and their own lives was to be the villain one final time. The next few secrets and lies begin to roll out in succession: Troy didn’t make up his handshake with Abed; he found it on a video. Abed has planted tracking devices on every individual in the study group. The revelation that Annie laced the group’s coffee with Adderall (she says amphetamine, but for all intents and purposes it’s the same thing) to keep them awake to study for their Anthropology final during their sophomore year is a LOT sadder than any other confession that’s made and also the only thing in this episode to rub me the wrong way (if I had to give a grade, I would give the episode an A- and the minus would ONLY be due to this tiny but significant issue). Annie's lie means that she had or still has access to Adderall and yet doesn’t feel that it’s a big deal; and, essentially, the episode tells us as the audience that this isn't a big deal either. But... this is a woman who literally entered rehab FOR her addiction to the drug and yet had it readily available and used it to keep her friends peppy and awake during a cram session. I think this bothers me more than it was intended to, but it’s something that’s kind of taken lightly on the series. Annie’s drug addiction is mentioned a few times directly and then with moments like this, I’m often disappointed in the show (sorry Alex and Harmon) for taking her addiction so lightly and treating it as something so careless that COULD be developed but isn’t. And apparently Annie wasn’t doing too well her second year at Greendale because she felt the need to have access to the drug again. Was it because of the strain that Jeff put on her after “Anthropology 101” in regards to their non-relationship? Or living in that crappy apartment? Or constantly fighting with Britta? Or the revelation that Jeff and Britta had been sleeping together the entire year while she shared moments with him, too? Regardless of the reason that she had the Adderall in her possession, it will always pain me that this show takes Annie’s REAL drug issue and condenses it into a brushed off joke. She deserves more than that as a character and I know that Community isn’t a drama, but still, I had hoped for more than that. Anyway, Abed is the most upset about Annie lacing the coffee because while his tracking of the group members doesn’t directly affect them (they didn’t even KNOW about it), Annie messed with his brain chemistry and that is something she shouldn’t have done, given the fact that it is quite delicate to begin with. But the betrayals don't stop there – as it turns out, Abed has been "Catfishing" Annie by creating a fake Facebook boyfriend for her. And he did it because when Annie had a boyfriend, she was happy and made pancakes all the time. (That’s another thing: HAS ANNIE BEEN DATING? WHY DON’T WE KNOW ABOUT THIS?) Annie is utterly outraged and rightly so: she bore her soul to her “boyfriend” and Abed manipulated her for his own personal gain. How, she defends, is that better than her lacing the group’s coffee to keep them awake? In fact, Annie goes a step further in her outrage: she asks if Abed even cares about them at all as friends and human beings. It’s something that we’re always inclined to ask, really. We wonder if Abed cares about his friends when he manipulates them or if he merely cares about his own well-being and the balance of order too much to care about the individual participants. … Or am I the only one who wonders that? Annie and Abed’s fight sparks more outrage and confessions, each study group member pinpointing lies on everyone else (“Jeff made me apply for handicap parking so he can get a better spot!” “Britta invited Garrett to Annie’s birthday party!” “Troy won’t sit on a toilet seat after Jeff!” “When we’re alone, Shirley refers to you guys as ‘THOSE PEOPLE.’” “When Annie’s feels like a female tooch, she calls Jeff her uncle!” “Shirley thinks we’re all going to hell!”) And when Jeff breaks up the arguing by insisting that they stop letting Pierce tear them apart, Mr. Stone hits them with a weight of truth: Pierce hasn’t asked anyone a question in a long time; they were doing this to themselves. The reality that the study group doesn’t need Pierce to dissolve into madness and chaos and fighting is perhaps one of the most significant aspects about this episode. It proves to the group and to us all that it was not Pierce who caused issues, not really. It was the baggage – the secrets and the lies and the half-truths – of each member that caused the cracks in the armor. He didn’t have to do a single thing to facilitate that dissention. Jeff then decidedly (and excitedly) notes that Pierce was no worse than they were and that they are no better than he is so that must mean – logically – that no one is really all that bad after all. In fact, Pierce’s polygraph test should encourage the study group to confess their lies and their secrets because it means that they can be unafraid of their faults. Jeff claims that Pierce was unafraid of his and perhaps that was the lesson they needed to learn. It’s true, of course, that Pierce was unafraid of his faults. His speech to Jeff about failure in “Beginner Pottery” is my favorite of the entire series. Pierce didn’t have to lie to the group. In fact, he was always upfront with them. Brash and insensitive, perhaps, yes… but wasn’t Pierce nearly always honest? He laid his soul bare for the group and that’s something pretty cool and beautiful and what I’ll miss about Pierce. He lived his entire life just struggling to find happiness and I think the study group and Greendale are what truly taught him to just accept himself – flaws and all – and LIVE. And live he did. Troy, after a moment, accepts the conditions of the fortune and everyone is rightfully stunned. The young man then explains that he believes Pierce saw something in him that even he couldn’t see for himself, and that’s true for each of the other characters as well. Pierce saw how special Annie was and how amazing Britta was and how important Shirley was. And it truthfully made me sob because he knows that these individuals don’t know that about themselves. They don’t believe they’re anything special or unique, but PIERCE did. He always believed they were more than they thought they were. And Pierce’s final wish for Troy – his final question, truly – was this: “What are you going to do now?” It’s his final question to all of the group members, really, and it’s something so beautifully poignant that you can’t help but be taken aback by it. Now that he’s spoken these words from beyond the grave and now that he’s told them each that they’re valuable, how are they going to proceed? How do you move forward once you’ve shoveled through the lies and the secrets? Do you take that newfound knowledge of yourself and continue to lie to yourself and the people around you? I quite loved Walton Goggins’ character! BRITTA FINALLY GOT HER IPOD NANO IN 2014. Though I never watch “The Art of Discourse” because I loathe it so much (those teenagers, man), I was thrilled to see this callback come to fruition. I loved Jeff/Joel leaning back on the legs of his chair throughout the first few scenes. This is all that you need to know about my emotional well-being during the scene where Pierce asks his final questions. I got really emotional during Annie’s moment because I have called that tiara thing and her being Pierce’s true favorite for YEARS. I really love how they’re setting up Troy’s departure, even though it doesn’t make me less sad to see him go. Excellent review as I agree about the Annie drugging her friends part just seemed unnecessary. I feel like the show and Dan does not mention this as much as they should. I mean we never hear anything about Annie's parents. (I know we hear nothing about Troy's either but they have had him mention his dad a few times compared to maybe one mention of Annie's parents being divorced.) Sorry about that got off on a mini-rant. Just wanted to say another fine review and love your last few paragraphs where it's now time for Troy's arc to move on to a new challenge as will the rest of the group. Another great, detailed, review, but I have two issues. First, one of my favorite parts of this episode is the question to Abed about the squirrel. When the table reacts to Abed's answer, I keep thinking about Remedial's commentary where they discussed the idea that Abed is darker to the writers than they have put on screen. Here they have a nice place where the answer, that Abed's childhood does not fit the trope of a sociopath, allows everyone to breathe a sigh of relief. I thought that was important, although the rest of the epsiodes could prove that idea wrong. I get the feeling the Annie drug issue is a veiled shot at last year's puppet episode where Annie's character admitted to cheating on a history test, and whoring herself out to the professor in a foot massage. It didn't work. It felt, no pun intended, awkward, and it really seemed completely out of character. Here the writers are dealing with a similar situation, and they do a better job of it, although it is still an issue for the character.